This semester I have two evening classes on Mondays and Wednesdays finishing at nine o'clock. This allows me to have the morning off in lieu and some time to myself. There are several things I want to use this time for: some exercise, blogging, and writing a book. In 2012 when I first set out on a motorcycle trip around the entire coast of Ireland I started in Dublin at the South Wall (in photo below) intending to circle around the coast roads of Ireland. When the trip was complete I started to write a book about the trip beginning in Dublin and working my way clockwise around the coast. The intended title was The One Hundred Corners of Ireland. At the South Wall in Dublin Bay with Howth Head in background. When I first sent my early chapters on counties Dublin, Wicklow, and Wexford to various publishers I was rejected by them all. One called the samples "self-indulgent" and said "who cares" about my travels! In the end the Liffey Press published Exploring Ireland's Wild Atlantic Way which covered the coast from Kinsale to Derry. This book is now sold out and no longer available to buy new. 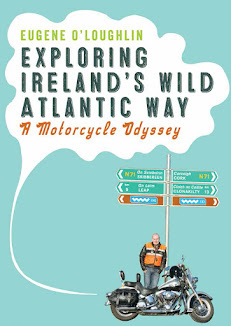 Last year I self-published Exploring Northern Ireland's Causeway and Mourne Coastal Routes through Createspace (paperback) and Kindle Direct Publishing (eBook). This book covered the coast from Derry to Newry. What about the east and south east coasts? Exploring Ireland's East and South East Coasts will be the third part of a trilogy following on from the two books above - I will self-publish this. I will have to manipulate the story of the trip so that I start at Newry and finish in Kinsale. I already have about 18,000 words written about Dublin to Kinsale, but much of this will have to be reworked to delete the "self-indulgent" bits! Also, I had not thought of adding photographs in my original 100 Corners book - but I will do so in the new book. Photos push up the cost of print to order books a lot, but I will also have a cheaper Kindle version as well. After several months of inactivity on this project, I am starting back on it today. In addition to reworking the Dublin to Kinsale bit, I will have to write Newry to Dublin from the start. I know I will also have to revisit some parts of the coast to get more photos from places that I either missed or did not get good shots first time around.